The month of September 2015 saw 66.66 Lakhs (6.7 Million) air passengers traveling with the Indian domestic airlines making Indian domestic air traffic rise 14.56% as per the data released by DGCA. The domestic airlines carried 590.21 Lakhs (59.02 Million) passengers during the 9 months period of January-September 2015, witnessing an increase of 20.1% over the same period last year, Jan-Sept 2014. Air India carried 10.59 lakhs (1.06 Million) passengers during September 2015, lesser than 11.25 lakhs (1.12 Million) in August 2015, but more than 9.67 lakhs (0.97 Million) in September 2014. However, Air India&apos;s market share dropped to 15.89% in the current month against 16.64% in August 2015 and 16.6% in September 2014. The domestic private carriers flying 56.07 Lakhs (5.6 Million) passengers increased their market share to 84.11% in the current month. IndiGo had its market share rise again after two months decline. The carrier flew 24.3 Lakhs (2.43 Million) passengers securing the leading position. IndiGo secured a market share of 36.45% in the domestic air traffic market for September 2015. Jet Airways getting a little less traffic than the previous month flew 12.78 Lakhs (1.28 Million) passengers with market share of 19.17%. Air India was the third leading player carrying 10.59 lakhs (1.06 Million) passengers. 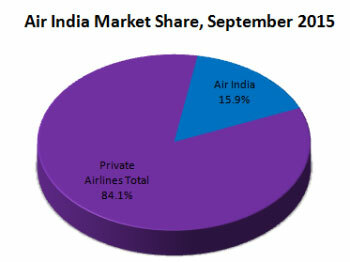 Market share of Air India was 15.89%. Spice Jet steadily maintained its market share at 12.29% at fourth position carrying 8.19 Lakhs (0.8 Million) passengers. GoAir at fifth position flew 5.79 Lakhs (0.58 Million) passengers with a share of 8.69%. Jet Lite flew 1.85 Lakhs passengers taking 2.78% market share at sixth position, while Air Asia&apos;s market share of 1.88% with 1.25 Lakhs passengers at 7th position was decreasing. 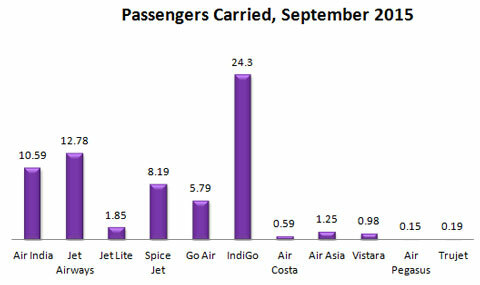 Vistara inching closer at 8th position carried 0.98 Lakhs passengers securing a market share of 1.47%. Air Costa with fewer and fewer traffic carried 0.59 lakhs passengers at 9th position with a share to 0.89%. Trujet continued at 10th position with 0.19 Lakhs passengers and 0.29% share while Air Pegasus carried 0.15 Lakhs passengers was at 11th position with market share of 0.23%. Looking at domestic airlines&apos; competitive market space, market share of top 4 players decreased to 83.80%. The top five players flew a total of 61.65 Lakhs (6.16 MIllion) passengers with market share of 92.48%, rising slightly. The bottom six players shared 7.52% of the Indian domestic air traffic market. The competitive space among the private airlines market is much more concentrated, with top 4 airlines securing 91.1% market share while top 5 taking 94.4% market share. 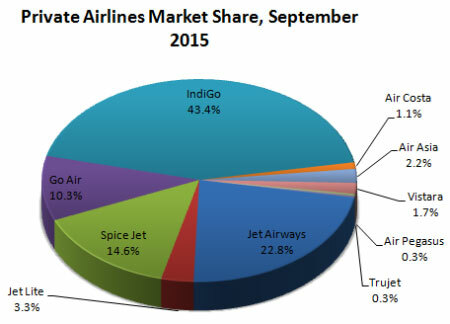 IndiGo leads at the top with 43.34% market share with Jet Airways at second place with 22.79% market share. 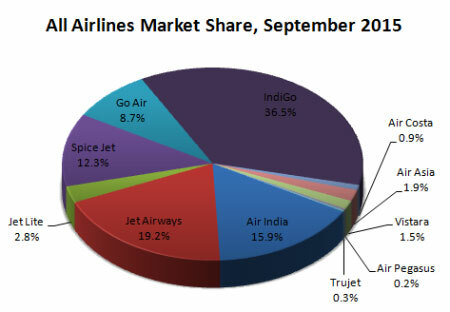 Spice Jet at third position corners 14.61% share while Go Air maintained its fourth position with 10.33% market share. Jet Lite with 3.3% share was at distant fifth player position. The five airlines make up for 5.58% share of the market shared among them as 2.23%, 1.75%, 1.05% and 0.29% and 0.27% market shares by Air Asia, Vistara, Air Costa, Trujet and Air Pegasus respectively.